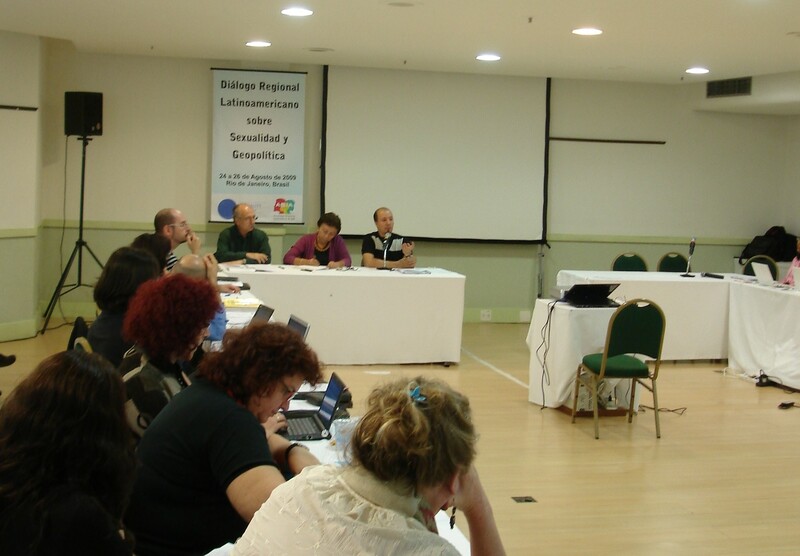 The last session of the Dialogue, coordinated by Gloria Careaga, started with the presentation of the overview paper Sexuality, Religion and Politics in Latin America, prepared by Juan Marco Vaggione, researcher at the Consejo Nacional de Investigaciones Científicas y Técnicas (CONICET- National Council on Technical and Scientific Research) and professor in the department of sociology at the Universidade Nacional de Córdoba (National University of Cordoba), in Argentina. Comments on the paper were given by Luiz Antonio Cunha, professor at the Núcleo de Estudos de Políticas Públicas em Direitos Humanos of the Universidade Federal de Janeiro (UFRJ) (Center on Human Rights Policy of the Federal Univresity of Rio de Janeiro) and coordinator of the Observatório da Laicidade do Estado (Laicité Watch Project). Vaggione began by underlining that both sexuality and religion are crucial dimensions to understand contemporary politics. Although modernity as an ideological project, aimed at confining both dimensions in the private sphere, has not happened. In fact, both religion and sexuality have been increasingly politicized. In the past and today, religious institutions and discourses have intervened in national and international politics exerting influence in the most diverse domains. In the case of sexuality, it should be reminded that its regulation has always been a state concern and moreover today it has become a core theme within the debate about rights and citizenship in Latin America. Sexuality and religion are so fully intertwined that it is always difficult to analyze one without addressing the other. In order to unpack how religion and sexuality are intertwined, Vaggione shared a brief revision of literature on sexuality, religion and politics in Latin America. He underlined that even if research on these subjects have increased, there remains much to be done and theoretical questions persist in regards to what has been produced. He also reminded us that the intersections between these three dimensions can be analyzed and interpreted in many different ways. The most widely known interpretation opposes progressive sexual politics to the so called “politics of the religious.” In other words, religion is the main obstacle to the agenda of sexual pluralism and reproductive autonomy. Historically in Latin America, these regressive roles in relation to sexual matters have been mainly played by the Catholic church. But as Vaggione underlined, presently the barriers to sexual plurality have also been created by Evangelical churches, in particular Pentecostals who explain homosexuality as devil possession that can be cured by exorcism and other means. The religious influence on sexual norms operates on two levels. On the subjective level, dogmatic sexual doctrine triggers cognitive dissonances between the religious affiliation of individuals, on the one hand, and his/her identity, desire and practices on the other. On the political level, it is easy to identify the systematic interventions created by religious authorities in relation to both the sate and public opinion in relation to sexuality–abortion, for example, among other related matters. He also remarked that today these interventions are, as they were in the past, performed by the religious hierarchy, particularly Catholic, through direct influence over state authorities. But also religious identities, be them Catholic or Evangelical, have become key expressions of civil society activism against sexual and reproductive rights, who express themselves as legitimate actors in the public sphere. While acknowledging that the so-called “return of the religious” is a major obstacle to sexual plurality and reproductive autonomy, Vaggione also suggested that it is necessary and productive to examine transformations underway in the religious field itself, in terms of identifying groups and voices that are open to sexual freedom and diversity. (and not religious principles), which must guarantee sexual freedom and diversity on the basis of the fundamental principle of respect to citizen’s freedom of consciousness and privacy. In this context of analysis, Vaggione underlined that laicité and the formal separation between church and state do not exhaust, however, the many challenges we face in relation to the expansion and legitimization of sexual and reproductive rights agenda in the region. He explained that even if the states would be effectively bound by principles of laicité, policy makers, judges, legislators or even ordinary people will keep their religious convictions intact and these convictions would still have negative impacts on perceptions, public policies and legal decisions about sexuality and reproduction. Consequently, a number of researchers and theorists today are re-thinking about the placement and role of religious convictions in the public sphere. It is true that many voices keep advocating for the classical vision of a sharp distinction between church and state, which require that persons should detach themselves from their religious values when they act as public agents. However, other voices propose that religious visions should freely circulate in public and legislative debates, but that laws cannot be grounded by religious principles. Lastly, there are those who consider that the dividing lines should not be draw in terms of church and state, but rather on the basis of private arguments and public reason. Luis Antonio Cunha started his comments remarking that he had both agreements and disagreements with the analysis presented. On the one hand, he considered that Vaggione’s reflections brought important contributions to the debate about religion and politics, such as the emphasis on the contradiction within the religious field itself, which encompasses sharp expressions of conservatism and signs of transformation. In his view, the paper contained significant illustrations of positive politicizing of the religious sphere that are inspired by the commitment to freedom. However, Cunha explained that this should not apply when considering laicité and secularism as old agendas that must be overcome and discarded. In his view, to conceptually overcome something is not to simply discard it. Cunha explained that he thinks it is possible to move ahead without abandoning some strong elements of the debate on laicité and secularization. This is required because much remains to be done in Latin America even on what concerns the “most primitive” feature of laicité which is the separation between church and state. One example is found in Argentina where the national constitution determines that the state is financially responsible for clergy. In his understanding, the proposition of a post-secular perspective to analyze Latin American politics should be empirically tested in national contexts. For Cunha, the recognition of contradictions and plurality that exists in the religious field should not make us discard the perspective of laicité. Additionally, he observed that in the paper quite often the terms laicism, laicité and secularism are used as synonyms and this is problematic because it is always crucial, in these debates, to distinguish secularization of culture from the laicization of states. Using Brazil as an example, he recalled that in the 19th century, an elitist and authoritarian laicité was established, as it was in other Latin American countries, and was inspired by ideas deployed by freemansory and positivism, which often implied propositions aimed at the elimination of the religious. However, in Brazil, this vision of laicité was eroded after the 1930’s coup d’etat and today, in Cunha’s perception, the country experiences an accelerated two fold process of the secularization of culture and construction of a new laicité. This process does not imply the reduction or elimination of the religious field as it did in the past. This can be illustrated by the New Year’s Eve ceremony in Copacabana that gathers millions of persons each and every year. Principally, it is evolving. Meanwhile, the Catholic Church systematically invests to regain control over the state of what is known to be the biggest Catholic country in the world–a move that has a clear geopolitical objective. To illustrate these trends, Cunha, mentioned that on that same day (August 25th, 2009) the Brazilian Congress could have eventually voted on the first agreement (concordata) between the Brazilian state and the Vatican. However, in his opinion it is very significant that the presentation of the agreement to Congress had triggered a reaction on the part of a wide range of religious voices, including Catholics as well as atheists and agnostics. This reaction is materialized, for instance, in a paid ad published in O Globo, the main Brazilian newspaper, which was signed by the National Council of Pastors and spoke strongly against the agreement and in favor of laicité. Therefore, Cunha suggested that the emergence of the phenomenon of political coalitions involving a wide range of religious voices to advocate for laicité should be incorporated in the overview paper, because this is a clear sign of the struggle for the renewal of secular democracies (laicité) in the countries of the region. This could allow for processes of laicization of states and secularization of culture, which are not always convergent to be examined more closely and through a comparative lens. Principally, such a step could reinforce the strengths of the paper and help leave behind what he considers to be less consistent in the analysis, in particular the appeal for post secular concepts and politics. In Cunha’s view, it is not possible to devise what may emerge from the processes currently underway.